The best compliment we can ever receive is hearing that we’ve inspired someone else with something we’ve done or said. I started blogging in February of this year because I wanted a place to work through my own thoughts on “leadership AND…” (basically my digital journal) as well as connect with other people out there working through (dis)similar thoughts. Maybe a tiny part of me wanted to reach somebody at least half as much as I’ve been influenced and changed by the bloggers I’ve read this year. I was very humbled, surprised, and grateful when I read Seth Berg‘s post naming his “Sunshine Award” recipients after he himself was so deservedly honored by a fellow educational blogger. Seth and I are separated by a couple thousand miles of mountains, desert, and Midwestern grain fields; Twitter has cut through the distance of time and space to help two educational soul-mates meet up and inform each other’s thinking. Seth’s writing has all the characteristics I like in a blog (that I think are shared by my picks below): meaty, chewy, substantive, layered, complex, inviting thought and dialogue. I’ve celebrated my picks for the Top 10 blog posts of 2013 already; this is another wonderful opportunity to participate in a culture of recognition and regard that I think makes the educational blogosphere so special. 3. Answer the 11 questions the nominating blogger has created for me. 4. List 11 bloggers that I believe deserve some recognition and a little blogging love! 5. Post 11 questions for the bloggers I nominate (cannot nominate the blogger who nominated me). 1. I’ve bike-toured in Spain, France, Italy, and down the Oregon/California coast. 2. I lived in Barcelona, Spain, during my last year of college. Spectacular city. 3. I oil paint – mostly landscapy kinds of things, hinting at abstraction. A musician friend has taken me on as a charity case and featured a few of my paintings on her covers. 5. My ideal vacation is backpacking in the Sierra Nevada mountains – or any mountains, for that matter (check banner image on this blog for proof). 6. I love the Spanish author Javier Marias (in the running for the Nobel Prize this year). If you haven’t read Corazon Tan Blanco (A Heart So White), I recommend it fervently. 7. I attended eight different schools over the course of K-12 – in California, Washington (state), New Jersey. I think it’s helped me be adaptive to the different schools I’ve worked at and will work at in the future. 8. I am LOCO for the Icelandic band Sigur Ros and seem to be a genuine pushover for all music in the ambient/electronica realm. 9. Best way to travel with the family? Home exchange. We’ve done it twice for three-week stints in Sweden and Montreal. Great way to meet other cool families too. Here’s one way to do it. 10. I enjoy how terribly I play golf. It is a great way to stay (very) humble and be an eternal beginner at something challenging. 11. I have found in my research that eating an entire box of cookies after a day of bike-touring is really, really, easy. 1. What is your favorite movie of all time? “Children of Men.” I’ll have to blog about why. It will be a really long post. 2. Which teacher inspired you most as a k-12 student? Señor Don Schrump, high school Spanish. I remember very clearly my first day of class with him as a freshman – we practiced correct pronounciation of Spanish place-names in California. Irreverent, funny, dramatic, demanding, passionate, memorable. 3. Are you a sports fan? If so, season? Team? If not, what does get you fired up? Basketball is my favorite sport to watch. It’s been my blessing/curse to have the Golden State Warriors as my team, though I’d say I follow them casually now. I have enjoyed watching the Tour de France over the years (I’ve seen a few stages in person). I get very fired up for the Copa Mundial. 4. How many siblings do you have? One sister. Try to spot her in this Apple ad. 5. Eat out or cook at home? Mostly cook at home. We make quinoa burgers that I would comfortably sell in a restaurant for $12.00. 6. Where do you go to get away? Anywhere outdoors. 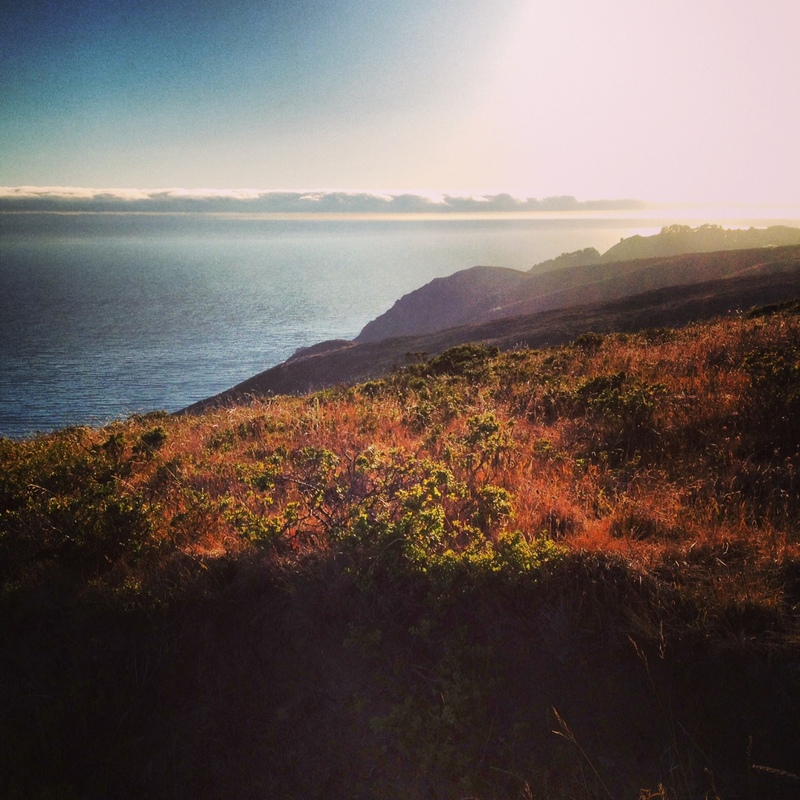 High desert, mountains, beach – a rocky, wild, hilly NorCal beach, that is! 7. What do you do for fun? Hobby? Run, hike, ride bikes, chase around the firey comets that are my two children. 8. Read any good books lately? Snow Crash by Neal Stephenson, thanks to a recommendation from David Theriault and a parent at my school. This guy foresaw virtual reality/online avatars in 1992! 9. Favorite pizza toppings? Simple – a perfectly made margherita or thin pear slice with gorgonzola. 10. Addicted to any television series? The Wire. Can’t shake it. Don’t even think of it as “TV” – just as art and social critique at their BEST. Hey, I even developed a whole leadership course around it! 11. What would you have your readers know about you that you haven’t shared? My wife (high school science teacher) is incredibly cool. Seeing her work always reminds me that teaching requires total dedication and soul. David Theriault – Dispensing inspiration like fast-acting medicine. Cortisone needle to the heart, making you feel like Uma in Pulp Fiction. #BAM. Steal Like a Teacher – courtesy of Sean Ziebarth. A staff that uses Instructional Rounds to nourish a culture of shared practice. They need to bottle that spirit and start shipping it cross-country. Sam Boswell – Think about what it feels like to read a great poem. I am constantly surprised – and filled with sublime calm – each time I visit. George Couros – THE gateway blog for any school leader – or anyone who cares about education, period. Billions of people know about it, but I would be remiss in not including it in my “Best Of.” Straight up awesome dude. Shaun Allison – Site PD is best served on an open-source, transparent, shareable platform. Moment of jealousy: imagine being a parent at a school like this, where adult learning is put on display. Take note. David Culberhouse – My favorite place to meditate on leadership and the dynamic, delicate balance between confidence and humility. Julian Stodd’s Learning Blog – “The 9 Components of Social Leadership” is now hanging on my office wall. ‘Nuff said. Kristen Swanson – Standard PD is a zombie film. Kristen and the #Edcamp Movement are the miracle antidote; professionals learning from each other and doing so with (wait for it…) CHOICE! Karl Lindgren-Streicher – Team Bay Area. A teacher who makes classroom walls disappear by inviting us into his learning space via Twitter and his blog. Sorta like Neo in The Matrix. Pamela Moran – The thing about learning spaces is that they are not defined by physical realities, rather by dimensions of thought, memory, and presence in the moment. Someone whose writing and thinking feel native to me. Daniel Coffeen – Do you like art? Writing? How about plain, good old thinking? If you don’t, Daniel will kindly, uniquely help you. 1. What is the first (or next) book YOU write going to be about? 2. What is one place in particular you hope to visit in your lifetime? Why? 3. What is one place you REALLY love that you know you’ll return to? 4. What is something NEW you’ll do (in life) in 2014? 5. What is one book that has changed you? Why/how? 6. What practice/hobby/thing have you set aside that you’ll take up anew in 2014? 7. What is the best performance you’ve ever seen (any medium/venue/context…)? Indulge us with a few details. 8. What type of body of water calls to you the most as a special getaway? Any one spot in particular? 9. You have a free pass to any restaurant in the world: where do you go, what do you order? 10. What kind of a “maker space” do you have in your house? What does your dream maker space look like? 11. What is the most important attribute to possess as a 21st Century educator/thinker/creator? Posted in Leadership, School Culture, Social Media & Growth, Teaching, Technology in Education, UncategorizedTagged Blogging, Learning, TeachingBookmark the permalink.